Synapses, the structures that allow neurons to pass signals to one another, are essential to neuronal function. Proper formation and responses to stimulation of synapses both during development and in adulthood are fundamental to mammalian brains, but the molecular processes governing formation and modulation of compartmentalized synaptic assemblies are unclear. In a recent study, a group of scientists from the Hong Kong University of Science and Technology (HKUST) employed a biochemical reconstitution approach to show that, both in solution and on supported membrane bilayers, multivalent interaction networks formed by major excitatory postsynaptic density (PSD) scaffold proteins led to formation of PSD-like assemblies via phase separation. The reconstituted PSD-like assemblies can cluster receptors, selectively concentrate enzymes, promote actin bundle formation, and expel inhibitory postsynaptic proteins. The findings were published in the journal Cell on Aug 2, 2018. Synapses, the most basic units for a neural circuit to form, do not behave in a static and linear way, as connection nodes in computer circuits do. As they are extremely dynamic both within each synapse at a short time scale and at the entire circuit level at a very long time range, understanding synapse formation and its dynamic regulation is essential to investigate how a specific neural circuit generates certain physiological functions. 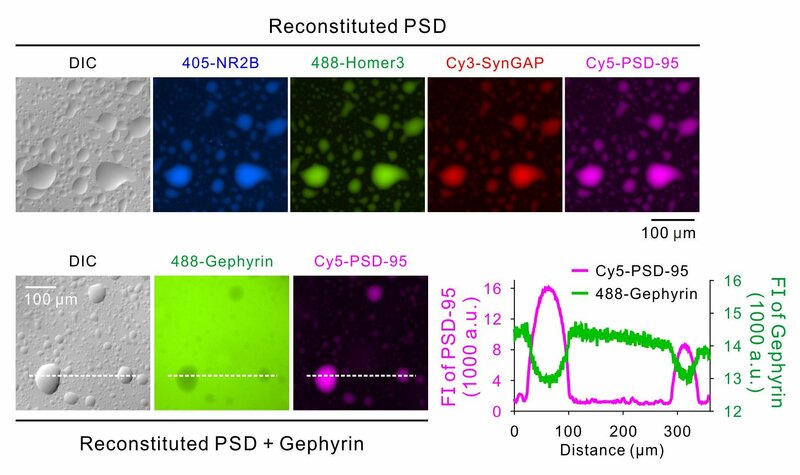 The reconstituted PSD condensates investigated in the study recapture several key functional features of the PSD in living neurons. First, the PSD condensates can massively cluster glutamate receptors on supported membrane bilayers, and the clustered NMDAR tails still manage to exchange with the diffused receptor tails on the membrane bilayers. Second, the major scaffold proteins are the critical determinants in driving the PSD condensate formation. Such PSD condensates can then enrich their binding enzymes such as SynGAP and CaMKIIα. Third, the PSD condensates formed by the major scaffold proteins can enrich the actin regulatory protein and promote actin bundle formation. “The information derived from such a reconstitution system, together with experiments performed in living neurons, offer valuable insights in understanding roles of these proteins in synaptic formation and functions,” said Professor Zhang. “Although still vastly simplified, this well-defined biochemically traceable system provides a platform and a new paradigm for studying excitatory PSD formation and regulation as well as for elucidating mechanisms of a range of brain disorders caused by mutations of synaptic encoding genes in the future.